The 2018 NHL All-Star weekend in Tampa was full of pirates scowling the streets, heartfelt moments and some sick goals by the top players across the league. The first event of the weekend was the free concert at Curtis Hixon Park. Central division captain and Nashville Predators’ defender P.K. Subban introduced both acts, Moon Taxi and Fitz and The Tantrums. All-Star Brayden Point and Steven Stamkos from the Tampa Bay Lightning were also in attendance hyping up the crowd. One of the two main events for the weekend, the Skills Competition, took place Saturday night. 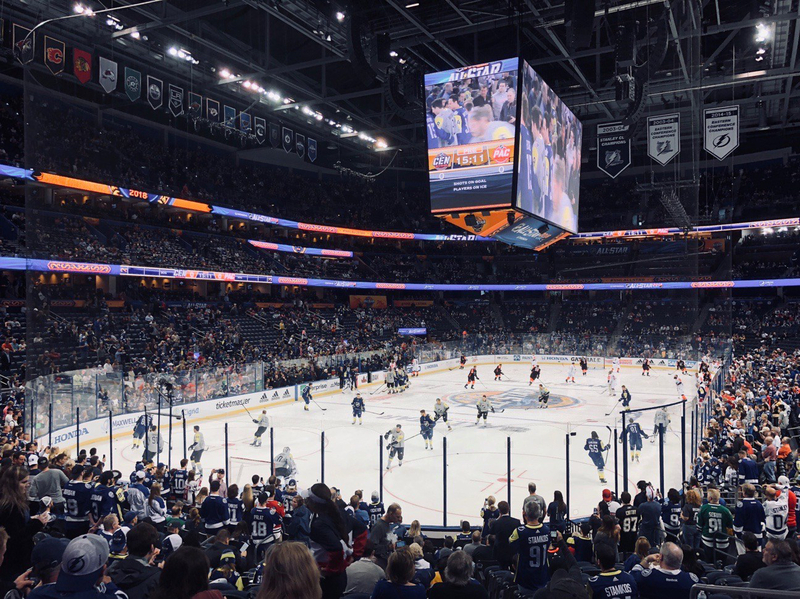 The Skills Competition featured six events: the Enterprise NHL Fastest Skater, the Dunkin’ Donuts NHL Passing Challenge, the GEICO NHL Save Streak, the Gatorade NHL Puck Control Relay, the PPG Hardest Shot and Honda Accuracy Shooting. Eight skaters participated in the fastest skater competition, a timed lap around the rink. Edmonton Oilers center Connor McDavid finished first with a time of 13.454 seconds, followed by Point with a close time of 13.579. Eight players competed in the passing challenge, a three-round competition consisting of target passing, give and goes, and mini nets. St. Louis Blues defenseman, Alex Pietrangelo, came out on top with a time of 46.610. Eric Staal, center for the Minnesota Wild finished second with a time of 54.679. Five goalies participated in the save streak challenge, where the goalie with the longest consecutive save streak during his time is net wins. Marc-Andre Fluery from the Las Vegas Golden Knights came out on top with 14 saves in a row. Pekka Rinne from the Nashville Predators came in a close second, with 13 saves. Eight players participated in the puck control relay, which consisted of stickhandling, cone control and gates. Calgary Flames winger, Johnny Gaudreau, finished on top with a time of 24.650. New York Islanders’ center John Tavares finished second with a time of 28.242. Five players competed in the hardest shot challenge. Washington Capitals winger, Alex Ovechkin, finished first with a shot recorded at 101 mph. P.K. Subban finished second with a 95.5 mph. Eight players competed in the accuracy shooting contest, where the player shoots at five LED targets on the net. Brock Boeser, a winger for the Vancouver Canucks, took the gold with a time of 11.136 seconds. New Jersey Devils center, Brian Boyle, finished second with a close time of 11.626. The main event of the weekend, the NHL All-Star Game finished with the Pacific Division on top. The first game, the Central Division vs. The Pacific Division ended in a 5-2 win for the Pacific. The second game between the Atlantic Division and the Metropolitan Division ended in a 7-4 win for the Atlantic. Lightning winger Nikita Kucherov netted an impressive hat trick during the game securing the win for his team. In the final game, the Pacific vs. The Atlantic, Rickard Rickell from the Anaheim Ducks led the Pacific with two goals and one assists. NHLAll-Star MVP, Brock Boeser from the Vancouver Canucks, finished the game with one goal and one assists. Despite powerhouses like Kucherov, Stamkos and Matthews, the Atlantic were not able to produce when it mattered, losing 5-2. Mike Green, defenseman from the Detroit Red Wings was able to score two goals in the game, but that was not enough to defeat the Pacific. Brian Boyle from the New Jersey Devils was perhaps the center of attention during the All-Star Weekend. After replacing injured Taylor Hall last minute, Boyle was greeted with love from all the fans. Last summer, Boyle was diagnosed with chronic myeloid leukemia and was unsure of his future in hockey. Now, former Bolt, Boyle has tallied 11 goals and six assists this season and was able to participate in the All-Star events this weekend.